If you didn't know that this was a true story you would think that it was a great story, but hope that this kind of thing never happens. Well it is a true story, amazing as it is, and it is one that will stay with you long after you have read the last page. The book is set in the 1980s during the Iran-Iraq war, Abbas is nine years old, and when he turns ten he will be expected to become a soldier and fight. His father does not want this to happen, and so they sell everything of value they have so that Abbas and his Mother can leave for Istanbul and attempt to get Visa for the UK. At the airport, Abbas' Mother is told she can't leave Iran, so Abbas is sent to Istanbul alone. So begins his amazing story. In a strange country where he doesn't speak the language, Abbas strikes it lucky with the first person that he meets, a taxi driver called Ahmed. It is only a brief encounter, but Ahmed ensures that Abbas finds a decent hotel, and it's here that he will spend the next 3 months. The hotel is reasonably priced (saving his money has been drummed into him by his father), but the area is not great and the room has cockroaches and his sheets are always a little dank. The one saving grace is Mourat, the owner, who takes Abbas under his wing. I won't give a blow by blow description here, but the time Abbas spends at the hotel would be quite an adventure for anyone, let alone a nine year old boy. He manages to navigate his way through the city, find the best rates to exchange his money, make his way to the British Embassy, wangle himself a job at the hotel, learn backgammon and make a friend. As I said, if you didn't know this was a true story you would find it hard to believe. This boy, who is so mature in so many ways is also just a 9 year old boy who cries himself to sleep and misses his Mum. 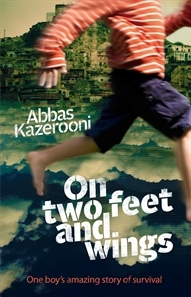 As much as I found this book so sad, it's not actually a sad story, Abbas is a funny and courageous character and as he has written the book, you know it will not end all that badly. One other thing that I think of when I read books about children living such difficult lives, is how lucky I am to have been born where I was. The one reason Abbas had to go through this is because he was born in Iran, for those of us living in countries not surrounded by war and conflict, we should be forever grateful. I won't give too much away, but where this book ends, is also the beginning of a new chapter in Abbas' life, and the afterward lets us know that there will indeed be another book, so we can follow Abbas on this new journey. Good day! In your post did you use the data from some studies or here are fully your private ideas? Many thanks in advance for your answer. Hi, What's written in my post are my own thoughts on reading the book, as well as some description of the storyline.